Juan Belmonte. He is mentioned, but does not appear, in The Sun Also Rises . 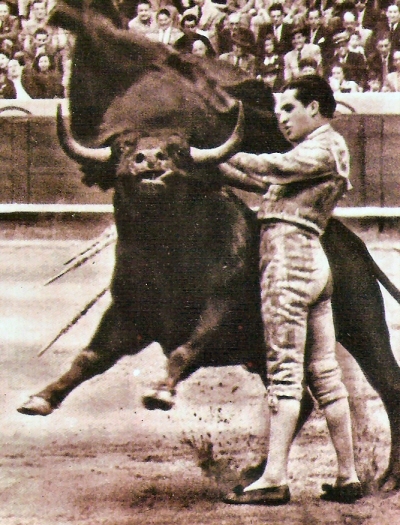 Hemingway regarded him as a great bullfighter. The Sun Also Rises is about more than bullfighting, or about drinking and fornicating. Two issues that I want to address are style and religion. * For those who have forgotten their 8ᵗʰ grade grammar a simple sentence consists of a subject and a verb. It may have a compound subject and a compound verb, such as Tom and Mary went to the store and bought some bread and some wine, but it is still a simple sentence. A compound sentence is two independent clauses joined by a conjunction such as and, or, but. A complex sentence is one with an independent clause and a dependent clause. We'll forgo any discussion of compound-complex sentences lest the reader fall asleep. * Hemingway, The Sun Also Rises , 3.
" Notice that Hemingway starts off with a simple declarative sentence. The next one though is longer, and the first clause is an imperative Do not think&ellip;, while the second is again declarative. The narrator, Jake, tells us what not to think and indicates that he did not find it impressive, and then immediately qualifies it with a statement of its meaning to Cohn. He has at once indicated the emotional and personal dfferences between him and Cohn. The next sentence is the longest in the paragraph, and conveys Cohn's feeling of inferiority, particularly because of his Jewishness, which was emphasized by being a bastion of WASP privilege. A simple sentence, such as He was Spider Kelly's star pupil, is immediately followed by a longer sentence that describes the kind of coach that Kelly was. The last two sentences immediately deflate Cohn's pretensions. Hemingway's style, at least at this stage, does not merit the parodies that are used to mock him. Hemingway is frequently classed as an atheist. I think at one time Wikipedia classed him as an American atheist. This seems to be largely due to a single quote from the entirety of Hemingway's work that All thinking men are atheists. That comes from his second novel, A Farewell to Arms, and while I haven't read it recently I want to discuss Hemingway's use of religion in The Sun Also Rises, and contextualize the other quote. * Hemingway, The Sun Also Rises , 78. His mind wanders during prayer, as it is wont to do even for the most devout. He regrets that he is not a better Catholic. There are other references to religion, and to Catholicism, throughout the book, and none of them are derogatory. Jake is at worst a sinner, i.e., human, and his religion is mostly a form of nature worship that is linked to Catholicism, and an aesthetic sensibility. “It is very valuable/' said the lieutenant. ”It tells you about those priests. You will like it,” he said to me. I smiled at the priest and he smiled back across the candlelight. ”Don't you read it,” he said. “I will get it for you,” said the lieutenant. “I believe in the Free Masons,” the lieutenant said. ”It is a noble organization.” Some one came in and as the door opened I could see the snow falling. “There will be no more offensive now that the snow has come,” I said.
" This occurs in the opening of the book, and is a discussion among a group of officers who are weary of the war. It open with the major making an assertion about the pope and the Austrian emperor. The assertion that the church is reliant on the rich and powerful was a fairly common dogma among radicals of that era. A book by Umberto Notari, an Italian fururist, is mentioned. It's not quite clear from the context what the book is about, and a Google search doesn't reveal much detail about the book. * Presumably it's an anti-clerical, anti-religious book. That leads into the major's remark about thinking men being atheists. The major says this, possibly with the intent of shocking the priest, but it occurs in the framework of a conversation of men who are battle weary, and seeking amusement, in this case a bit of mockery. From the declaration of atheism we then move on to the Free Masons, an anti-clerical group, at least in its European versions. (What it is in its American form I have no idea.) It is after this that we turn to the topic of the offensive, with the major urging Lieutenant Henry to go on leave and see a bit of Italy. * Two of Notari's books are available on Amazon, but they are in Italian. The conversation opens with a bit of negotiation. What should we talk about? The first topic that comes up is a book, and then atheism. It then moves to another, more pressing topic, that of the offensive. Placing the declaration in the mouth of the major, rather than in the narrator's, would serve to minimize the importance of the declaration. There seems to be little evidence, based on the passage in question, to say that Hemingway, at least in the 1920s, was an atheist. I've re-read A Farewell to Arms in light of the discussion about religion. Religion is not mentioned as much in this novel as it is in The Sun Also Rises, and the priest is not blown up, as he is in the Rock Hudson, Jennifer Jones movie from the 1950s. The plot is extremely simple. Frederick Henry is hurt at the front, and falls in love with the girl. When the Italian front collapses during a battle, and men are being shot on the slimmest of pretexts for desertion, he flees, meets the girl, and they escape to neutral Switzerland. The girl is pregnant, he marries her, and she and the baby die. Hemingway has adopted throughout a neutral,reportorial style. His dialogue is not punctuated with he said, she said, followed by some descriptive term. You're left to supply the emotional qualifiers to the dialogue, much as Shakespeare is generally free of emotional stage directions, so is Hemingway free of emotional guidelines. Now the ending appears to have given Hemingway a fair amount of trouble. He wrote 39 alternate endings, including ones in which the baby lives, and some that constitute the religious ending. Now the problem with a religious ending is that it would represent a violation of the approach that Hemingway has taken throughout the novel. The problem with the religious ending is that it would violate the flat, emotionless tone that Hemingway has established throughout the novel. Everything is presented as factual, and despite what we may believe and we may hope, religious knowledge and belief is not in the same realm as factual knowledge and belief. So Hemingway would be tossing in the religious element in a way that violate the approach the novel has taken so far. The religiosity would obtrude and mar the novel in a way that doesn't happen in a novel such as The Old Curiosity Shop> where Dickens' religious beliefs permeate the novel. Next up, Victor Davis Hanson's The Savior Generals .